In 1992, after a decade of working too much and playing too little...I took the radical step of moving to Taos, New Mexico. I made this 'leap of faith' because a part of me yearned for experiences that were not possible in the urban environment of Dallas. The journey lasted 13 incredible years! Since there was no real economy in northern New Mexico for a commercial photographer, I found myself travelling a lot to make ends meet. Because of that, I didn't photograph much when I was home because I wanted to use the time to "play" and not work. By the late 90's however, I began to realize that Taos was changing and that I needed to record the places and things I loved while it was still possible. The photographs you see here are part of that effort and all were made between 1998 and 2013. After a brief stint on the outskirts of town, my wife Sarah and I moved into a beautiful old home in downtown Taos. As such, we lived very close to the Taos reservation. Unlike most Native American tribes in America, the Taos indians were never moved from their ancestral lands. 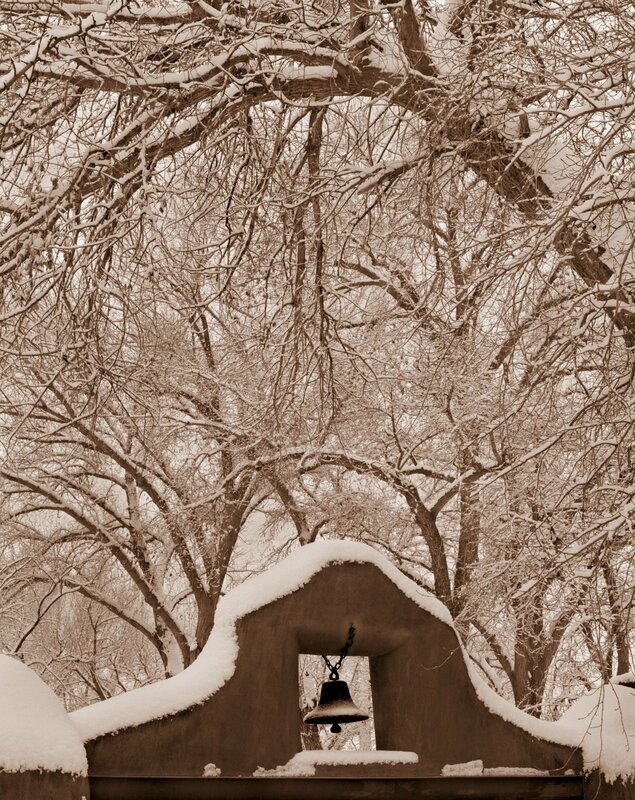 The image that you see above is the original Taos Pueblo and it is hundreds of years old. I made the photograph at sunrise in the year 2000 and at that time, there was a large fire in Los Almos. 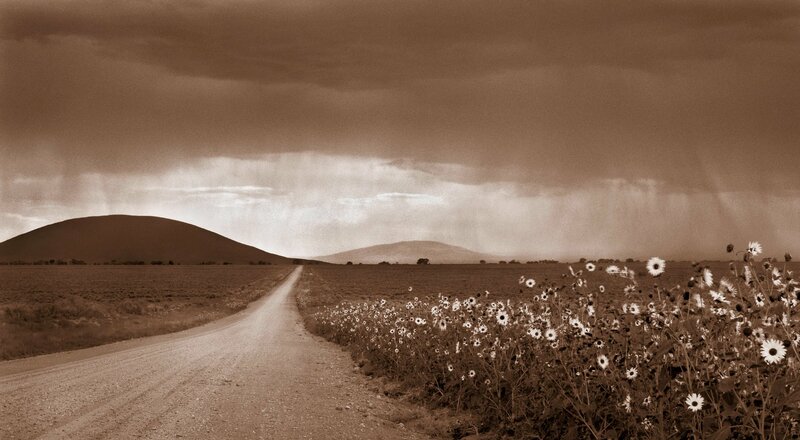 The smoke drifted over to Taos and ended up being a gift for me, as it lends the image a wonderful air of mystery. Every year in Taos there are one or two mornings of deep fog and when I looked out the window on this particular day, I knew exactly where I wanted to go. 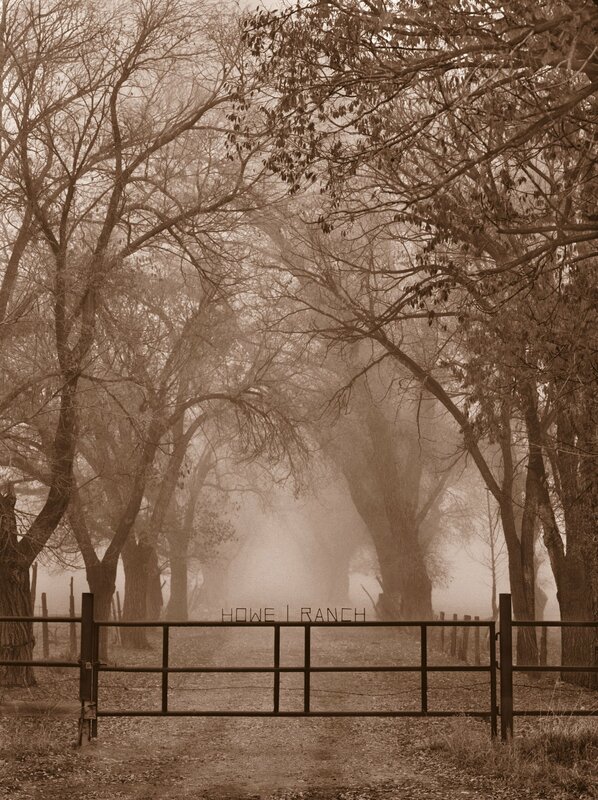 The Howe Ranch was only about a mile from my house and I drove by the scene at least five times a week. I loved the graphic quality of the gate and how the trees receded into the background. Still, when I would try to photograph it...there was always something missing. When I drove up to the gate that morning however, it was abundantly clear that the missing element was present and everything fell into place! Mabel Dodge, a New York socialite and art patron, moved to Taos in 1919 to form a literary colony. She purchased a number of acres bordering the Taos Pueblo, married a Taos native by the name of Tony Luhan, built a house and then invited numerous artists (such as D.H. Lawrence, Willa Cather, Marsden Hartley, Ansel Adams, Georgia O'Keefe, etc.) to come and visit. Today, the Mabel Dodge Luhan house continue's to be a haven for artist's and writers. I visited it during my first week in Taos and connected with the "vibe". This shot was made after a magical winter snowfall and the huge trees that you see snaking through the air above the property are ancient cottonwoods. Distant vistas and open expanse of sky is a common site in northern New Mexico. When one see's moisture falling from far away clouds (as illustrated in the photograph above), it is called "Walking Rain". Have always loved that expression! 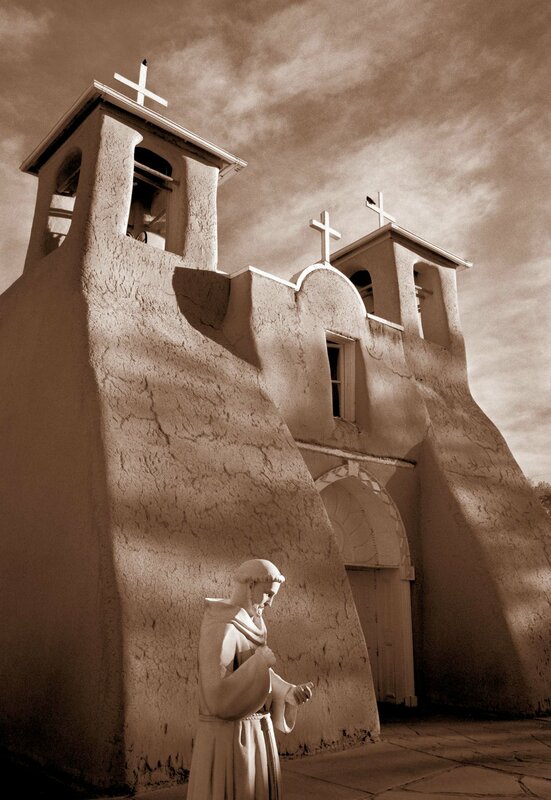 The San Francisco de Asis Mission Church is one of the most well known sites in Taos. It is located on the south side of town in the historic Ranchos de Taos Plaza. Built in the late 1700's, it is a classic adobe structure. The back side of the church was immortalized in photographs by Paul Strand and Ansel Adams and in paintings by Georgia O'Keefe. Didn't want to duplicate a view that is so readily recognized...so I spent a good deal of time "looking" at the rest of the structure and eventually settled on this. Classic New Mexico! In the summer of 2000, all of the kids in the neighborhood were in a tizzy because the forest service had closed the hiking trails due to drought. In an effort to boost morale and give them something to do, my wife Sarah spontaneously said..."Let's build a float for the 4th of July parade!" The annual small town event is held in the village of Arroyo Seco. It is known and loved within the community... and the kids were immediately on board! Sarah's friend Annie volunteered her old truck and together they decided to create a 'Statue of Liberty'. Using found objects for the structure and sculpting mesh for the body, they built the entire thing in a single day. The kids had a blast the following day covering it with paper mache'. It dried overnight and they painted it the next morning. The result blew everyone away and the kids were so excited! To make this photo, I drove it out of the barn and down the road about 500 ft. I used the medium format Contax I had at the time with T-Max film. 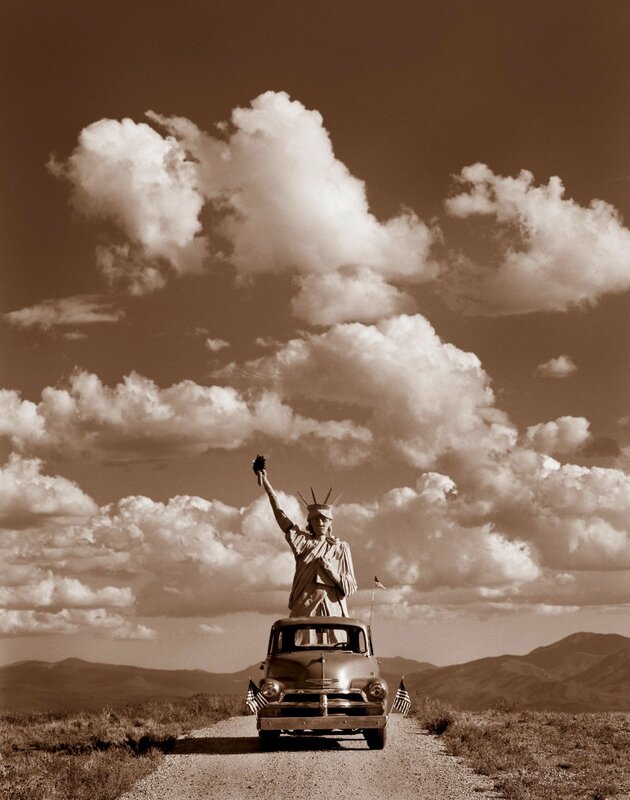 The photograph that resulted is an American classic...and one of my all time favorite images from the Taos period! Allan - Thanks for the images. Excellent work! A huge compliment coming from you! This was an amazing chapter in my life and re-visiting the imagery brings so many memories! Photography is so good at that. chris baker - All Gorgeous Images...love the howe ranch gate shot and especially your rain over dirt road/flowers... beautiful work.